The final week of Music@Menlo’s 10th anniversary season began with a Café Conversation which opened the eyes and ears of the audience to the possibilities of music education through the internet. As a long passion and curiosity for me, I decided to share many of my favorite videos, recordings, and web sites – focusing especially on our students. 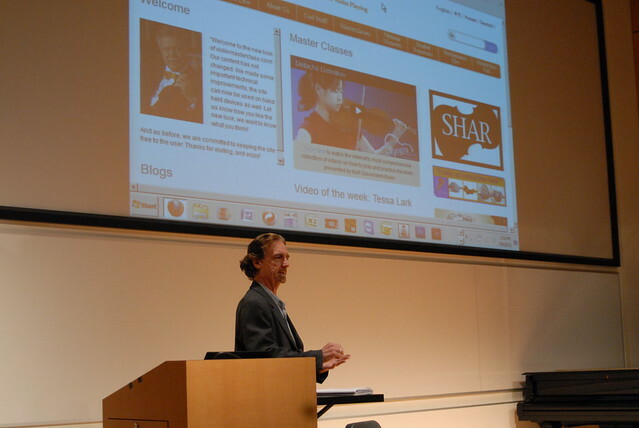 Dividing my talk into three segments – music lessons, master classes, and performance examples – the hour and 15 minutes flew by as we toured violinist Kurt Sassmannshaus’s violinmasterclass.com, Paul Katz’s cellobello.com, and my own cellotalks.com. We then moved to the masterclassfoundation.com site which offers numerous classes, and we watched Daniel Barenboim working with both Lang Lang and Alessio Bax on Beethoven. Finishing up with performances, the room sat in an awed silence as we experienced the incomparable sound of David Oistrakh in Debussy’s Clair de Lune. The week included a fantastic series of master classes, one after the other, led by Ani Kavafian, Gilbert Kalish, Ian Swensen, and finally Wu Han on Friday. She worked magically with two Young Performers’ piano duos on Mozart and Schubert with the hall packed full of listeners. Her ability to express herself powerfully, and to inspire, always enables young musicians to rise to higher levels and to produce new and more musical sounds, right in front of the audience. And she does it all so naturally, and with such love – sometimes tough love – that it draws everyone together onto the same page- like very few artists I’ve ever seen. 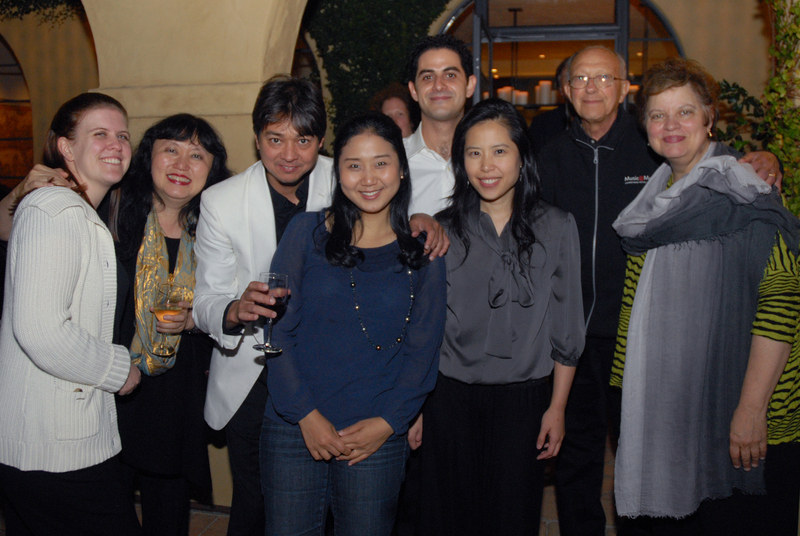 Wednesday brought the season’s final Encounter, led by festival Artistic Administrator, Patrick Castillo. 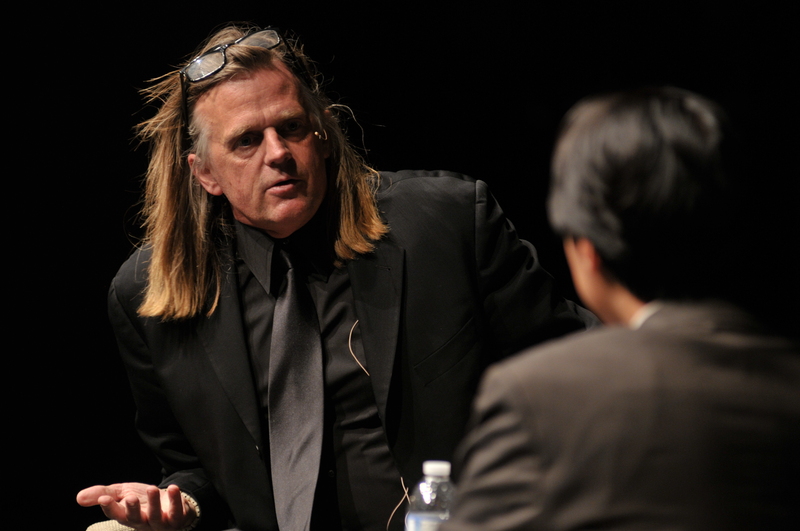 Focusing on the diversity of musical experiences today, and on today’s uses of music and listening habits, Patrick courageously put forth strong theories concerning the role of music in contemporary society, challenging his listeners with experimental and provocative musical examples. Declaring rightly that “Music today is inescapably everywhere” , Patrick reasoned that music is an important means of engaging with the world of our time, and his selections – from Steve Reich to Mario Davidovsky – justified his arguments. 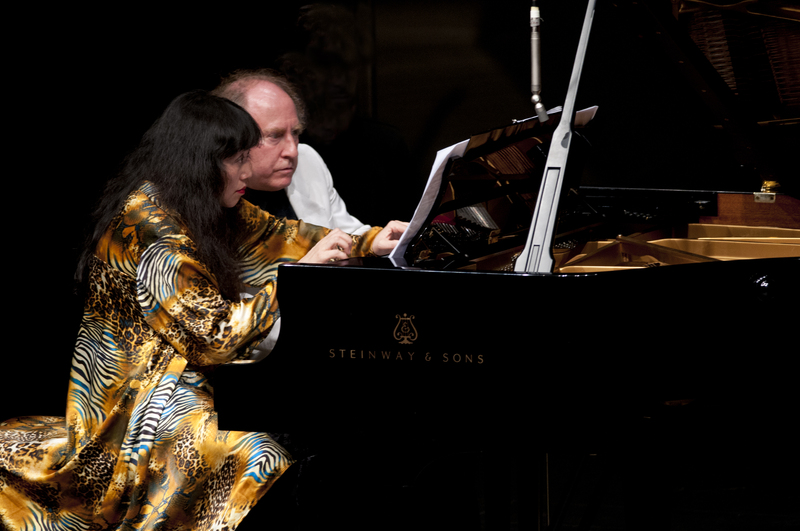 A riveting performance by Gloria Chien of Davidovsky’s Synchronism for piano and prepared tape perhaps elicited a pivotal moment in the evening, in which an audience member suddenly spoke out saying “That’s not music!” The tension was high for a few moments while Patrick deftly navigated away from a protracted argument, but as Patrick said in his opening remarks, there are more questions than answers about music today, and it is precisely the questioning that is the most important process. 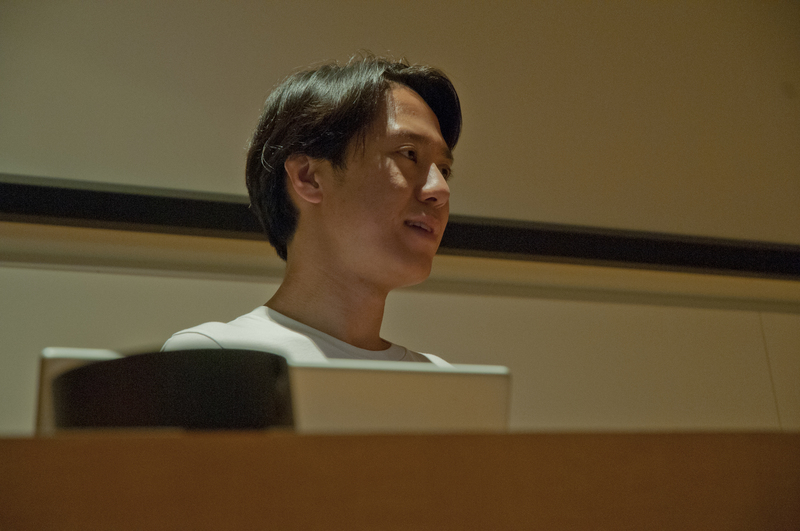 On Thursday, the pressure shifted towards me and Wu Han as we presented our Carte Blanche recital program. There is nothing quite like playing in front of your students: you tell them what to do and what not to do for 3 weeks, and then it is time for you to live up to the same expectations you have set for them. We played a program in which each work represented one of the main festival program themes: Our opening Strauss Sonata was Delighted, the Messiaen “Praise to the Eternity of Jesus” was Inspired; Wu Han’s Spanish dances by Albeniz was Motivated; Glazunov’s “Minstrel’s Song” was Transported, and finally, Chopin’s Cello Sonata was Impassioned. We made it through somehow, and people seemed to enjoy it, which is the most we could ask for in the middle of our heavy festival schedule. 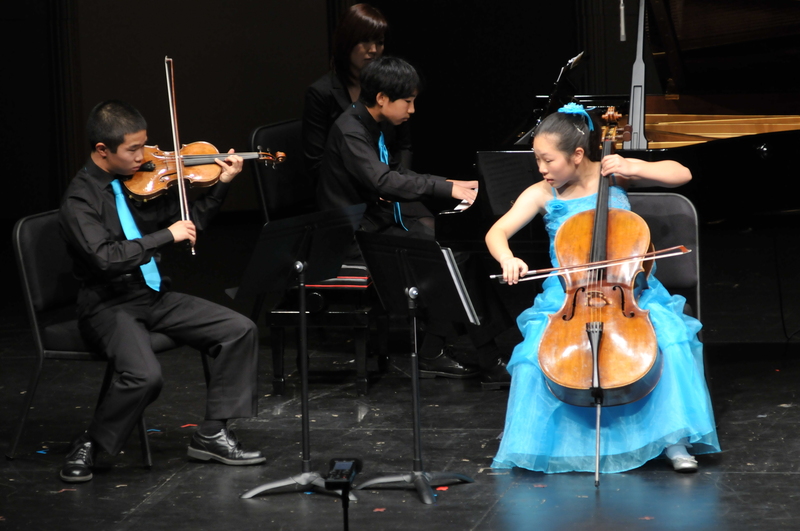 On Saturday at noon, the final Koret Young Performers Concert took place in the Center for Performing Arts at Menlo-Atherton. These events have always been packed, even though we are now presenting them in our larger 500-seat hall. 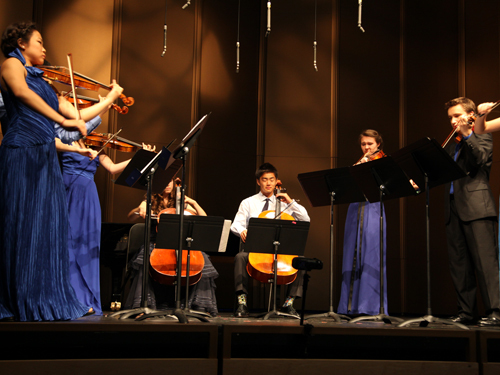 Unusual ensembles, including two octets (Spohr and Mendelssohn) bookended the concert, which showcased the incredible talents and preparation of the students in violin duos, piano duos, and even a selection of sublime cello quartets. We could not be more proud of our students, and of our coaches, who all emerged for a well-deserved ovation from the audience of students, staff, parents, many senior artists and IP’s, the public, and of course me and Wu Han. 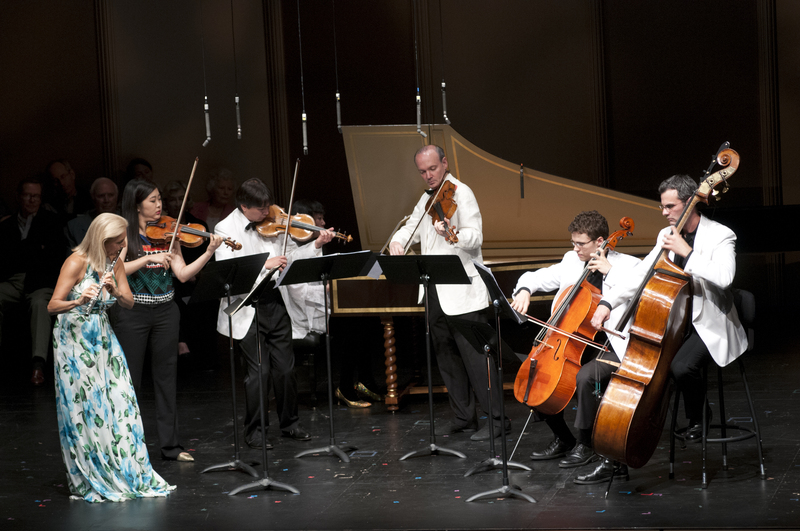 The summer’s closing concert, entitled Delighted, presented music which was designed to be enjoyed. No lofty messages came off the stage on Friday and Saturday, but plenty of great music and phenomenal playing nonetheless. It’s possible that I have not heard a chamber music concert with quite so many notes, between Paul Schoenfield’s frenetic trio for clarinet, violin and piano, Mendelssohn’s Allegro Brillant for piano, four hands, Moszkowski’s virtuoso four-movement duo for two violins and piano, and the grand Chausson Concerto for violin, piano and string quartet. Ani Kavafian was the eloquent soloist in the Chausson, spinning out gorgeous lines while pianist Inon Barnatan, with the score mostly in his head but reading off an iPad nevertheless, dispatched the fearsome piano part with astounding command and musicianship. In a concert that was riddled with highlights, among them were: the triumphant violin performances of Sean Lee and Kristin Lee in the Moszkowski; the wild and funny performance of the Schoenfield by Gloria Chien, Arnaud Sussmann and Jose Franch-Ballester; and the expert performance of the festival’s made-to-order string quartet for the Chausson, consisting of Sean and Kristin Lee, Arnaud Sussmann on viola, and cellist Dmitri Atapine. A grand closing party brought speeches, tributes and thanks to all our staff, musicians, donors, board members, and many audience members who attended the event. In what seemed like a few moments, Music@Menlo’s 10th anniversary season had ended as quickly as it began, and everyone scattered: musicians running off to other festivals, some on the evening’s red eye flights to the east coast; staff back into the offices on Sunday for debriefings and festival clean up; and Wu Han and I back to New York for two nights only. 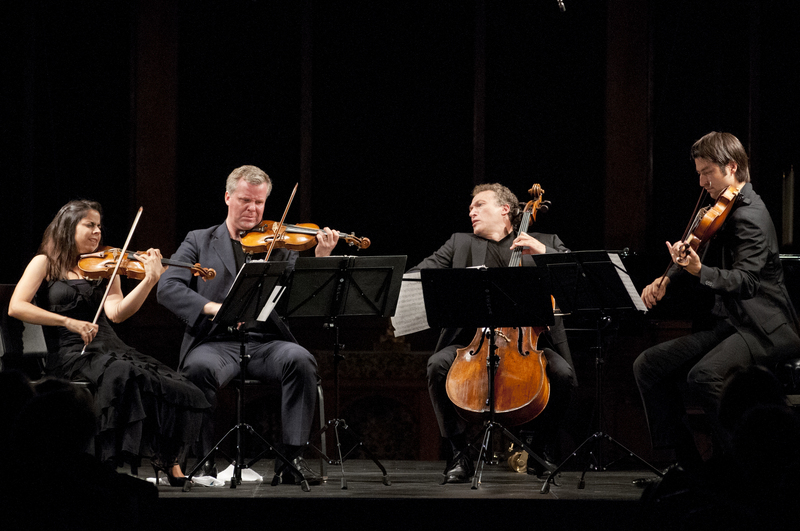 On Monday night in New York, the Emerson Quartet reconvened for a single concert at Lincoln Center’s Alice Tully Hall for a Mostly Mozart Festival concert. 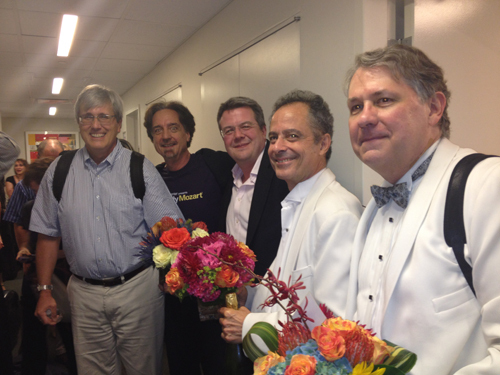 It was a great surprise, and delight, for me to learn that my successor in the Emerson, cellist Paul Watkins, was in the audience with his wife Jennifer, and backstage we saw each other for the first time since he accepted the position of cellist in the quartet. We gathered joyfully for what will be, I’m sure, the first of many group photos. Stay tuned to this blog for a major post from the next chapter of our amazing summer. The Festival’s third week began with two “dark nights”, with no evening concerts or events; however, the days were packed with rehearsing, coaching sessions, and our daily 11:45a.m. master classes and Café Conversations. 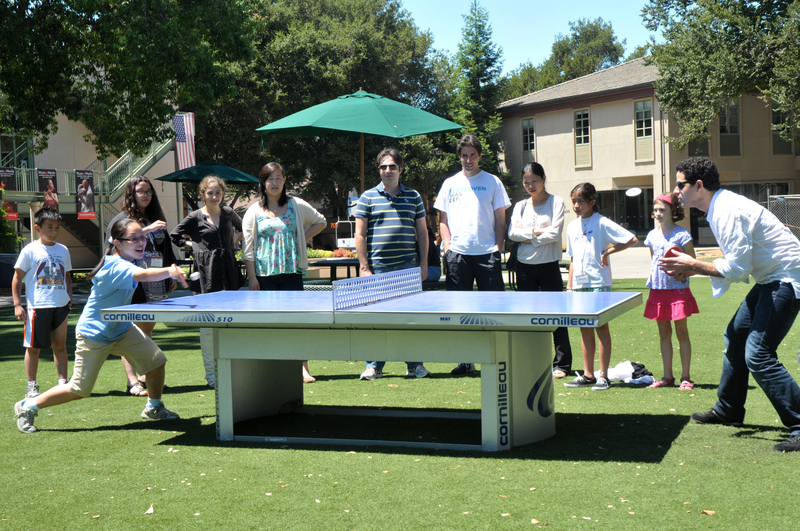 The annual ping-pong tournament reached fever pitch. Wednesday brought the highly anticipated Motivated program, which brought together a diverse collection of music that was created for, or inspires, dancing. 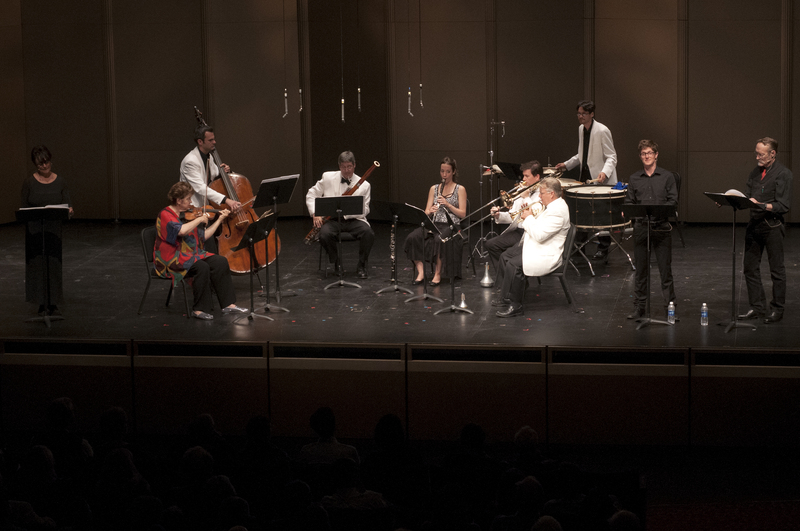 Bach’s Suite in b minor for flute and strings opened the program, led by Music@Menlo favorite, flutist Carol Wincenc. 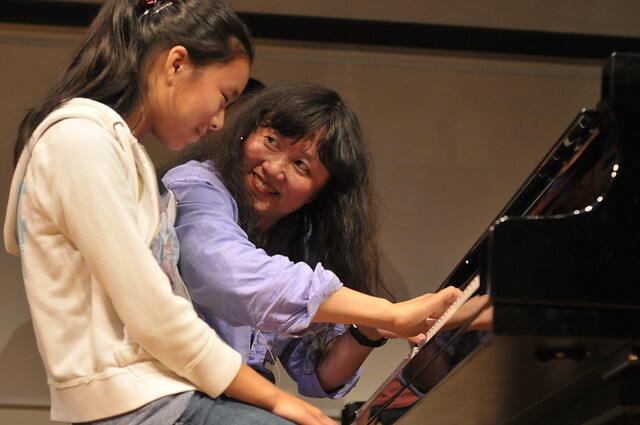 Wu Han made (according to her) her U.S. debut as a harpsichordist. The program continued with music of Schubert, Debussy, Strauss, and Bartok, before a large cast took the stage to close with program with Aaron Copland’s all-time-greatest-hit, the ballet music for Appalachian Spring, written for the Martha Graham dance company. Performed in its original version for thirteen instruments, without conductor, it is still truly a magical experience to hear and perform. Some of us – like myself and Carol Wincenc – actually played in orchestras led by Copland during our early free-lancing days. After the Motivated program, what seemed like a huge number of artists departed. This is always a sad moment, as we wish all our artists could stay for the whole festival. 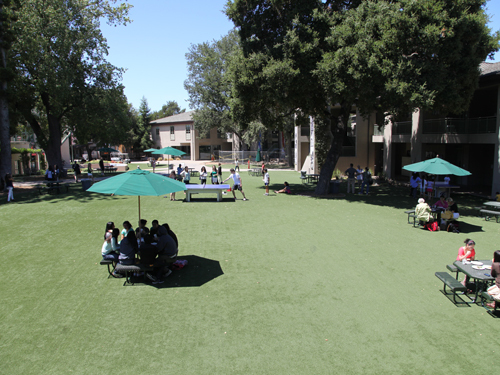 We bid them farewell with great food and toasts at Menlo Park’s Café Too. The next day, all of our Institute students, plus the lucky members of the public who attend our free master classes and Café Conversations, were treated to a fascinating lecture and masterful performance by cellist Laurence Lesser. Having recorded all of the solo cello suites by Bach just last year, Larry is very absorbed with them. In this instance he enlightened us on the differences between two versions of the Suite No. 5 in c minor, as Bach also wrote the piece for the lute. The lute’s ability to play chords – and therefore harmonies – more easily than the cello offers us a window on Bach’s harmonic design behind the notes, and Larry miraculously somehow manages to incorporate much of the lute chordal writing into his performance on cello. It was one of those defining sessions that truly shapes Music@Menlo an extraordinary and unique learning environment. 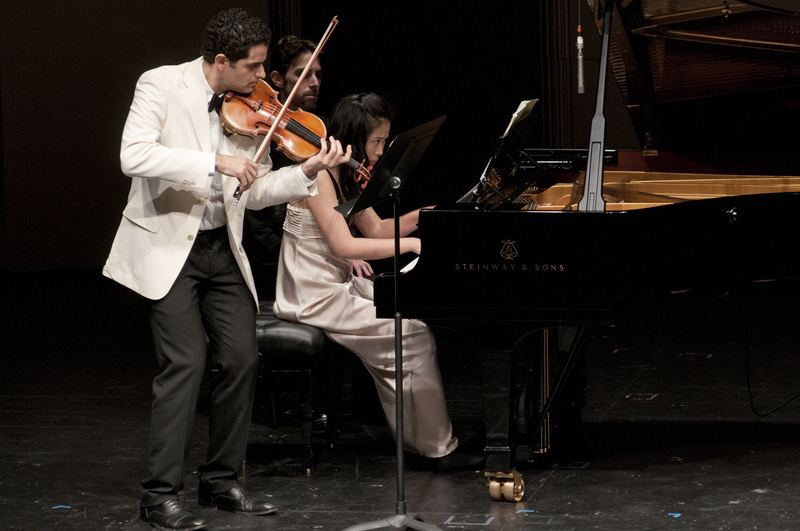 After the International Performers presented a beautiful Prelude Performance of piano trios by Ravel and Beethoven, it was time for the Encounter that focused on the spiritual power of music. 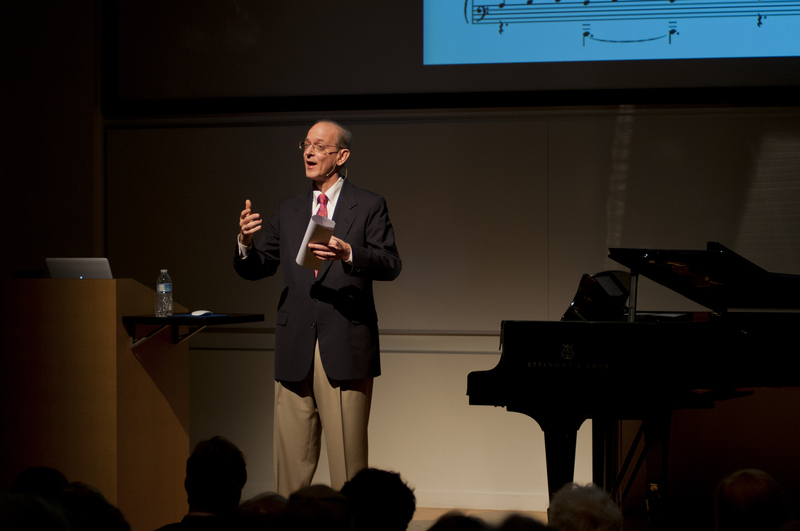 Michael Parloff, who last summer stunned our audience with a masterful talk about Brahms and the Schumanns, returned to tackle the tricky, ephemeral subject. He did so with great depth, while simultaneously laying out a thorough background for the next evening’s performance of Haydn’s Seven Last Words of Christ. Haydn composed his “wordless oratorio” in 1787 for Good Friday services in the Spanish town of Cadiz, which is located on the southern tip of the Iberian Peninsula. Haydn did not journey there for the premiere, but described in detail his challenging assignment, which was to compose seven slow movements, each illuminating the meaning of each of the last seven utterances of Christ as he was dying on the cross. For the service, the lavish interior of the church in Cadiz was draped in black, and a single light illuminated the musicians and the celebrant. We attempted to replicate this setting in one of my personal favorite venues, St. Mark’s Episcopal Church in Palo Alto- a home to festival concerts since our first full season. We succeeded to an astonishing degree, due not only to the dignified and spiritual atmosphere already present, but also to practical advantages, such as a marvelous and willing stage and tech crew, who figured out how to darken the space and position our special concert lights (the “Finckel” lights) directly above the musicians, creating a highly dramatic effect. But the truly extraordinary part was the performance itself, by a “festival quartet” composed of extraordinary players, who, before last week, had never played in a quartet together. Violinists Erin Keefe, Jorja Fleezanis, violist Richard O’Neill and cellist Laurence Lesser truly gave one of the finest quartet performances I have ever heard. On top of the challenge of learning the nine movements from scratch, I threw at them the Emerson Quartet’s transcription of the work which incorporates many elements from the orchestral score which are inexplicably missing from the later quartet version (I still don’t believe that Haydn himself made the quartet version). 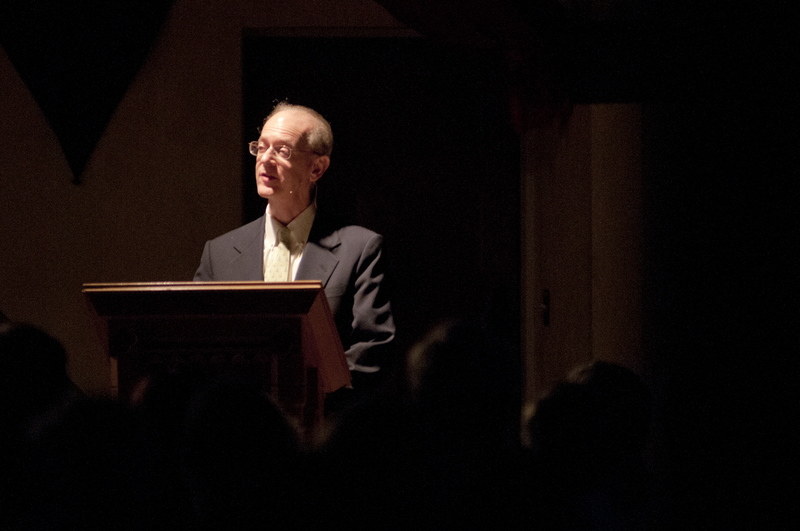 Between the movments, Michael Parloff read brief excerpts from the various gospels which recounts the crucifixion of Jesus, and quote His last words. It was profoundly moving. Saturday brought another extraordinarily rich selection of events and opportunities for listeners, students and performers. The early afternoon KYPC concert, at the Menlo Atherton Performing Arts Center, offered another round of amazing performances (and pre-performance speeches) from the festival’s youngest musicians. 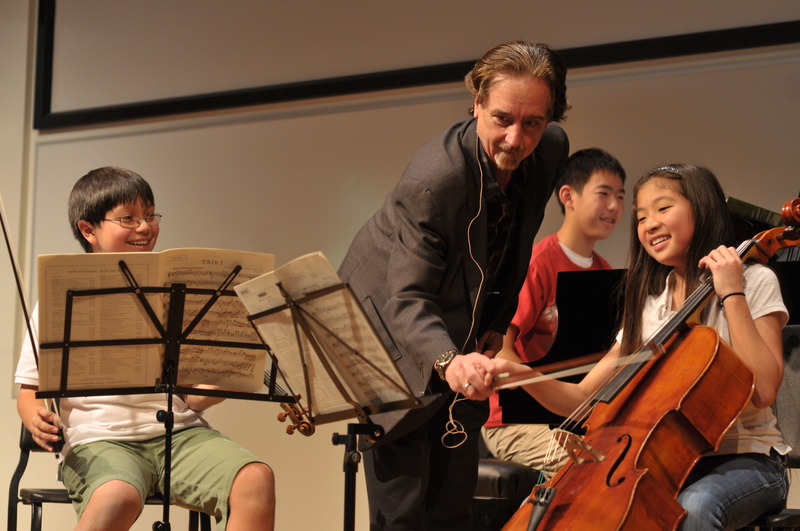 It is an enormous credit to both the students and coaches, that in such a short amount of time these young players are able to take complete control of themselves and their music in a professionally-produced concert setting, in front of a highly attentive audience of almost five-hundred listeners. 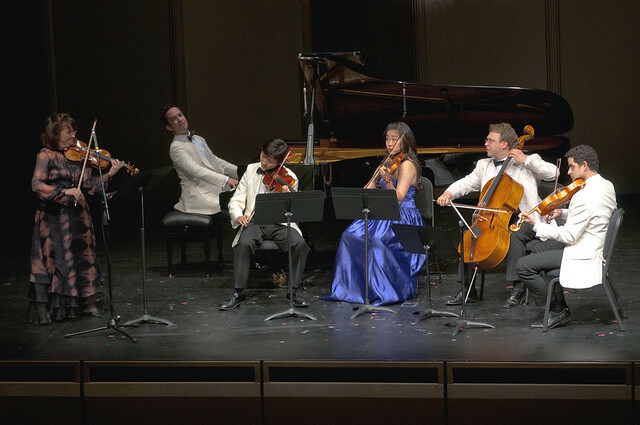 The evening offered one of the festival’s most unusual Carte Blanche concerts ever: Violin Celebration featured four diverse sonatas for violin and piano, performed by a cast of eight musicians, making up four different duos. 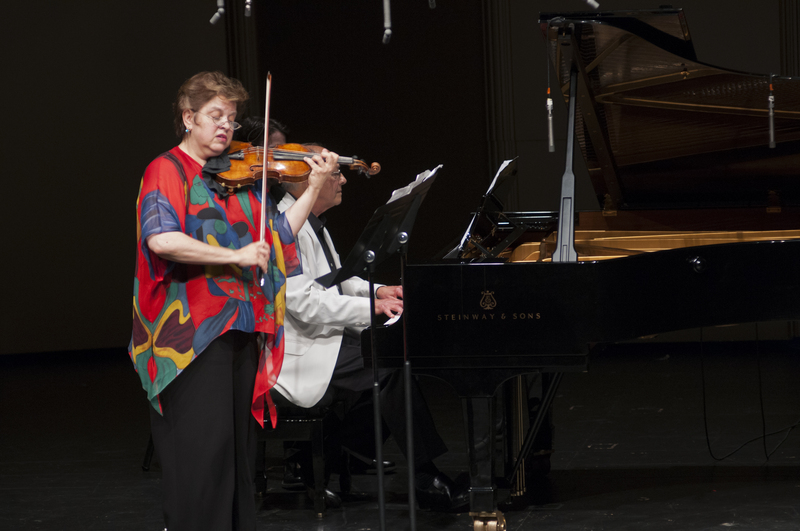 Erin Keefe and Wu Han began with a sonata by Beethoven, and were followed by Jorja Fleezanis and Gilbert Kalish in Copland’s seldom performed sonata, a work composed in 1943 and soon taken up by some of the greatest violinists of the day. 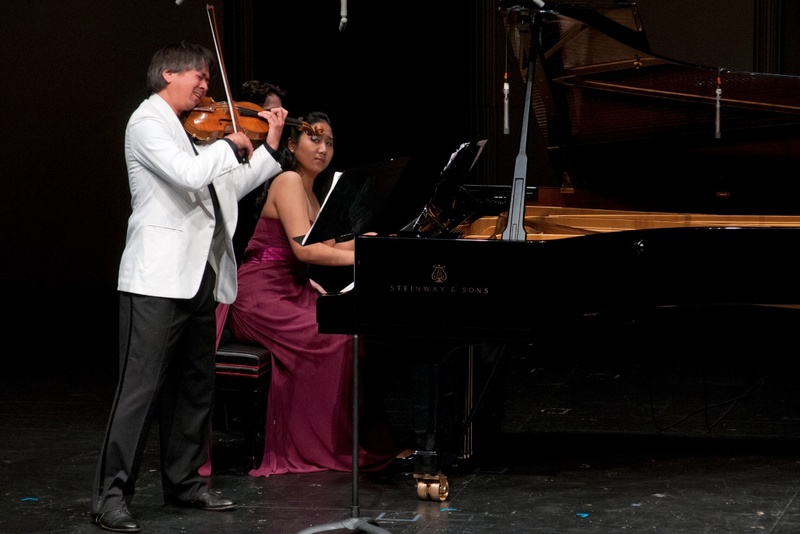 Following the intermission, Ian Swensen took the stage, partnered by pianist Hyeyeon Park, for Janacek’s gripping sonata, and the concert concluded with a blazing performance of the exuberant Strauss Sonata by Arnaud Sussmann and Gloria Chien. 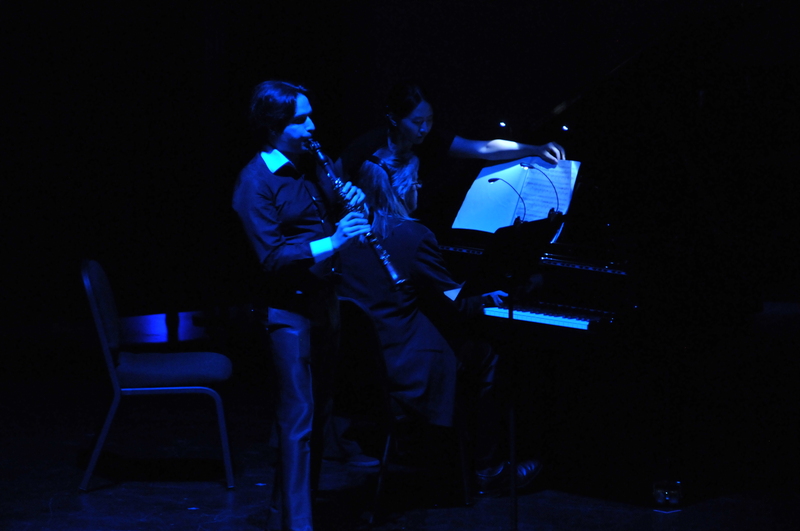 The concert was not only a triumph for the artists but also for the festival, which took something of a risk presenting a program so highly unconventional. The final ovation went on and on, and our listeners are still talking about it. On Sunday, Wu Han was again on stage in yet another role: the demanding Piano Quartet in g minor by Gabriel Faure. 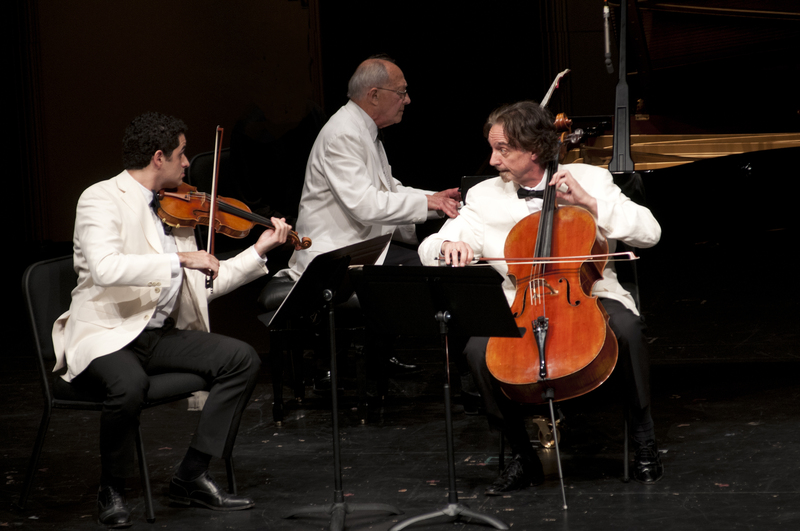 Partnered by violinist Arnaud Sussmann, violist Richard O’Neill, and cellist Dmitri Atapine, their performance capped off the Impassioned program: a collection of pieces were inspired by the deepest human emotions, and which elicit charged responses from listeners time after time. 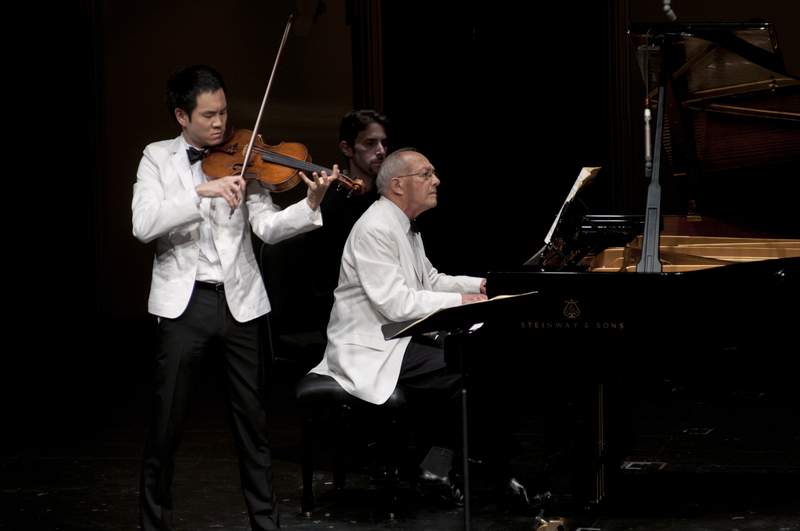 Opening the program was the magical Märchenbilder of Schumann for viola and piano, beautifully performed by Gilbert Kalish and violist Richard O’Neill, who make his Music@Menlo debut in fine style. Before intermission, Gilbert Kalish, Arnaud Sussmann and I offered Dvorak’s extraordinary Piano Trio in f minor, one of his most heartfelt and popular works, and one of a pair of giant trios that he composed just before leaving for America. After a marvelous party at the Knudsen residence – one of my favorite places here in California – we all went to bed rather late- eager to catch some sleep to prepare for the festival’s final week, which seems to have come, as it always does, far too soon. After a weekend packed with events, each one seemingly more momentous than the last, Monday’s dark night provided us all the chance to focus on the coming programs, to explore and experience more aspects of this multi-dimensional festival. 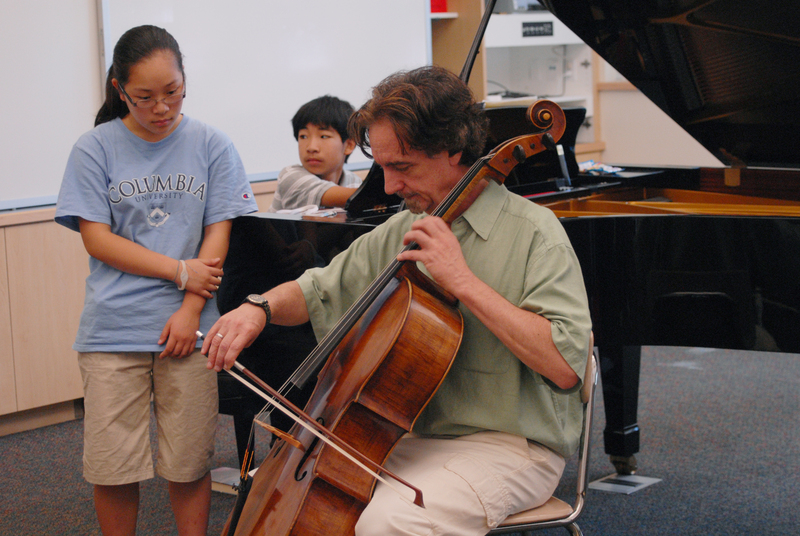 Wu Han and I largely immersed ourselves in the ongoing work of our Chamber Music Institute students, visiting classrooms for most of the day to either coach or to observe our faculty and artists at work. The Institute this summer comprises forty students; twenty-nine Young Performers and eleven International Performers. The International Performers, ages 18 to 28, perform hour long concerts before most of the festival’s ticketed events. The intensity of this program results from its repertoire demands: the International Performers repeat each work once, sometimes on consecutive concerts, and in a matter of days will reappear on stage again with yet another piece. 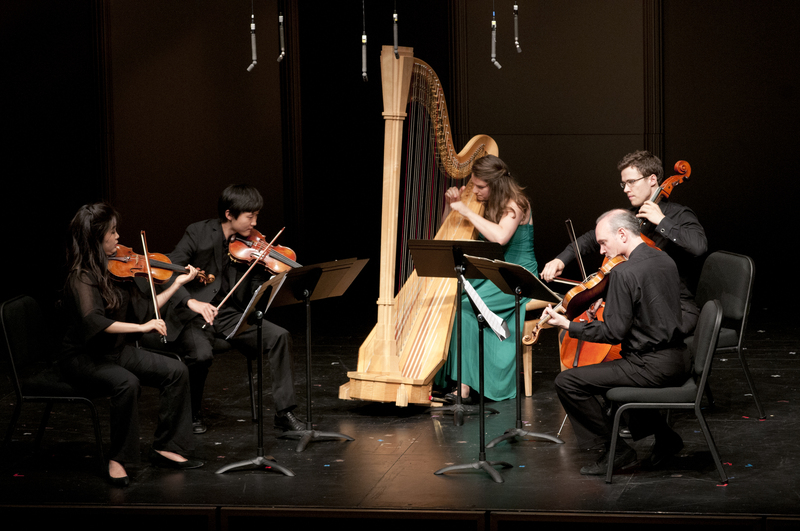 The repertoire, which we select for them, includes some of the most demanding chamber music ever composed. This season, for example, IP ensembles are tackling Bartok’s 2nd Quartet and the Ravel Trio, as well as works by Beethoven, Mozart, Dvorak, Brahms and Shostakovich. 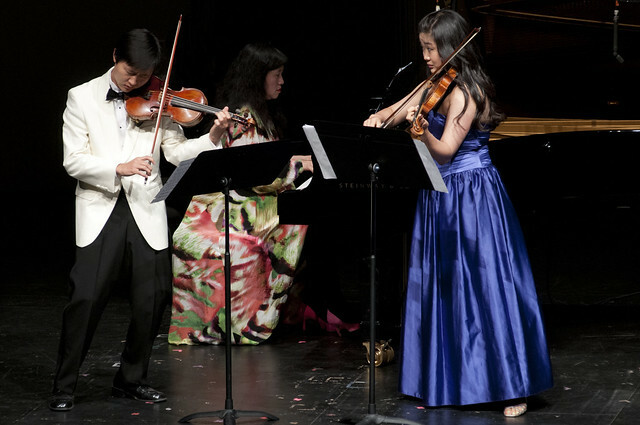 The Young Performers, who hail heavily from the Bay Area but also include students from far-away places, perform three major concerts during the festival, which usually take place in the Concert Hall at Menlo-Atherton before packed houses. Monday brought the first of this festival’s Listening Room sessions, a series devised and hosted by our Artistic Administrator Patrick Castillo. Although Patrick has grown to become one of the industry’s most respected artistic administrators, at heart he is a composer with a keen and adventurous ear that is always exploring innovative ways of hearing both new and old music. The Listening Room, held in Martin Family Hall, affords all comers the opportunity to experience a pure, communal sonic experience. In this session, listeners were treated to recordings of Bach for guitar, choral music by Finzi, the Agnus Dei from the Stravinsky’s Mass, Ligeti etudes, and Bill Evans’s “’Round Midnight”, preceded by the brief introductions by Patrick. 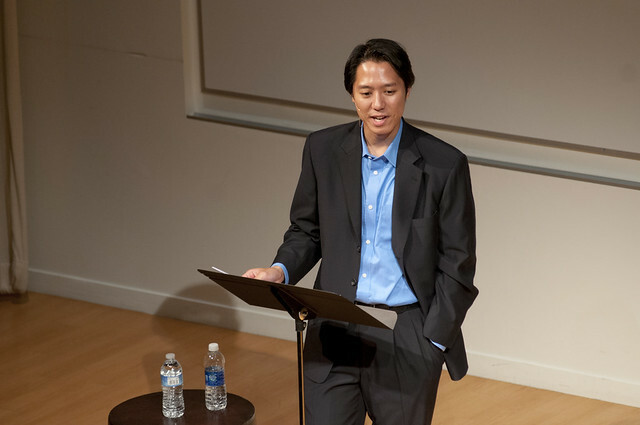 Tuesday’s 11:45 a.m. event slot was filled with the festival’s annual Poetry Reading, hosted by Patrick Castillo, Assistant Artistic Administrator Isaac Thompson, and violinist Jorja Fleezanis. Begun by the late Michael Steinberg in the festival’s early years, it has become a beloved and unique tradition in which the audience – comprised of all the CMI students and a large following of the public – are invited to the stage to read poetry that the festival collects or poems of their choice. Following the conviction – voiced initially by Michael and reprised eloquently by Patrick – that the experience of live poetry can greatly expand emotional and intellectual horizons, Music@Menlo proudly presents this event as one of the unique facets of its profile. 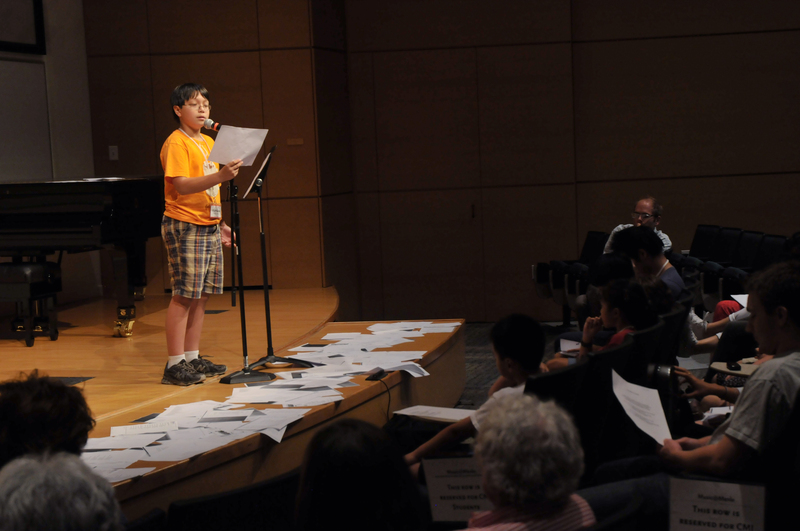 Often, some of the festival’s most inspiring moments occur, as perhaps a very young student, or maybe a shy one, will suddenly blossom during the delivery of a thoughtful, funny, or profoundly moving poem. Tuesday evening, after another heavily-attended Prelude Performance, saw the Pacifica Quartet deliver the festival’s Illuminated concert. 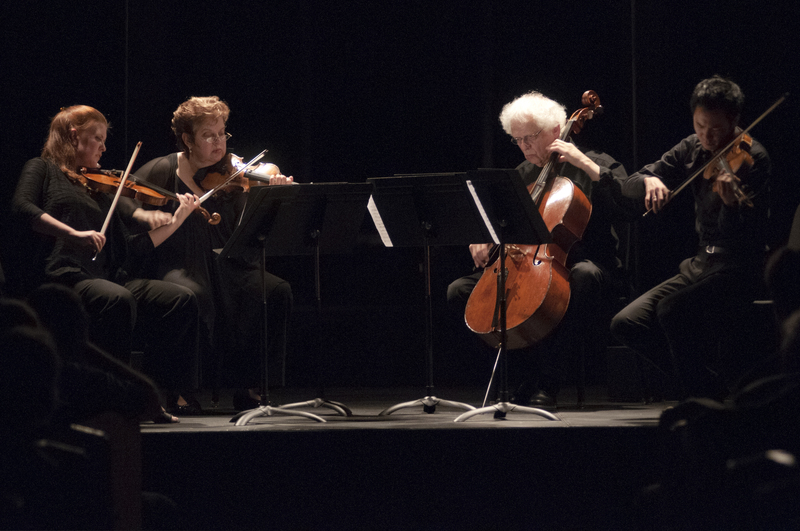 The perfect program to illustrate the ways in which music can bring listeners into the worlds of composers, the concert featured three classic, autobiographical string quartets: Beethoven’s Op. 135, his final completed work, Janacek’s quartet Intimate Letters, and Smetana’s quartet, From My Life. Each work tells stories from the composers lives, some funny, some poignant, and some quite provocative. 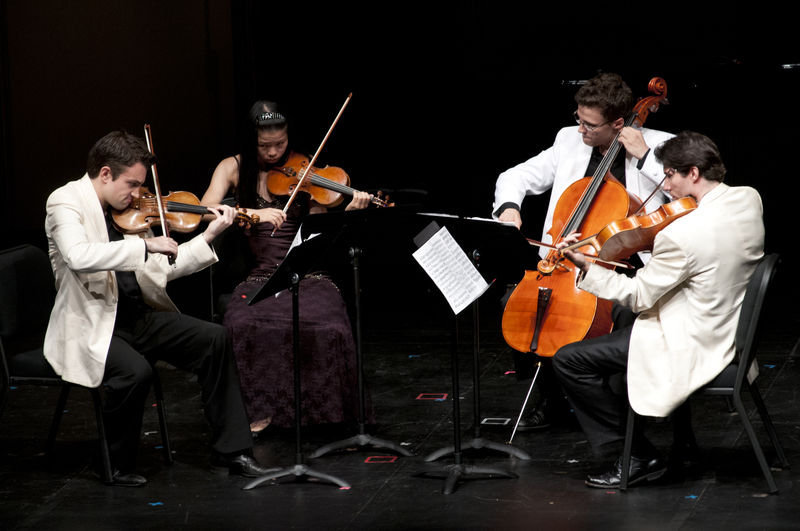 Having never combined these works in my own quartet experience, I was more than pleased to hear from the Pacifica how much they enjoyed performing this program, and that it even appears in their concert offerings for the coming season. Indeed, the audience came away having truly gotten to know three great personalities of classical music, through performances that were as emotional and committed as one can hear anywhere. 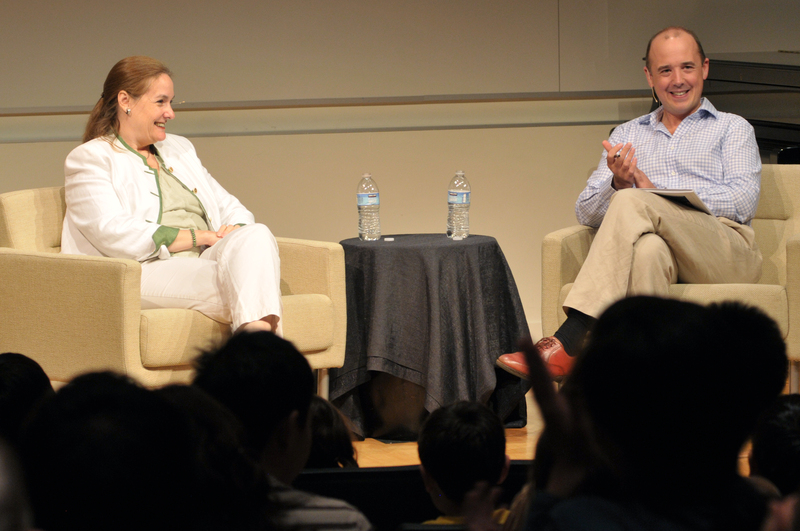 Even before lunch on Wednesday, our Institute students and public were treated to a fascinating Café Conversation between soprano Susanne Mentzer and visiting BBC Music Magazine Editor Oliver Condy. Titled “The Art of the Voice”, the two discussed Suzanne’s evolution as a singer, and the relevance of the vocal arts to instrumental music. 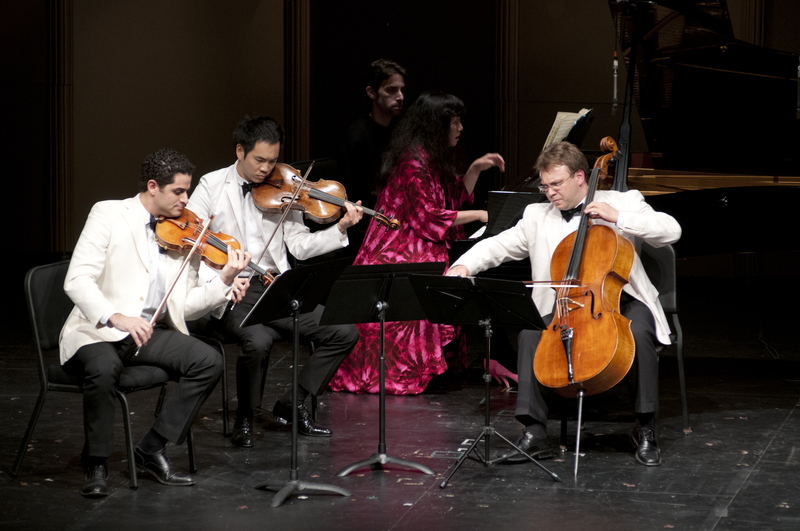 Before the repeat of Concert Program II, our International Performers presented an extraordinary all-Shostakovich Prelude Performance consisting of his Cello Sonata and Eighth Quartet. 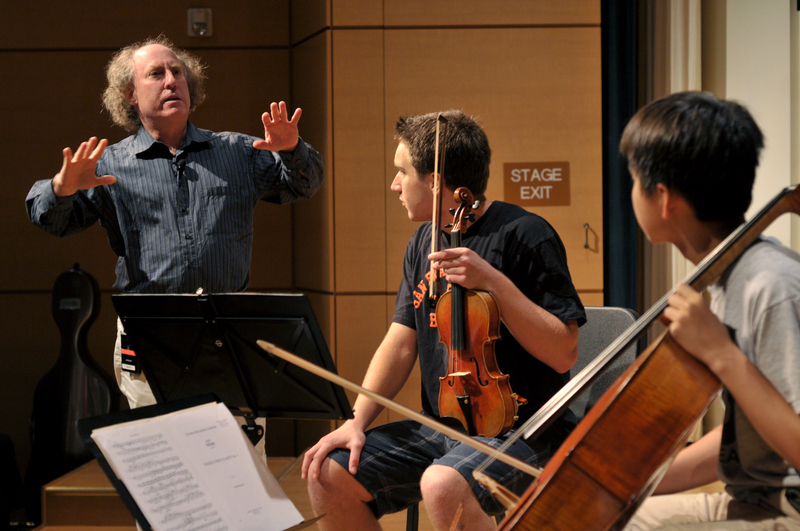 Thursday brought a Master Class from pianist-conductor Jeffrey Kahane, in which he worked with our Institute students on the Dohnanyi Piano Quintet and the Mendelssohn d minor Trio. Jeffrey, always an amazing artistic and intellectual, shared his wisdom generously, bringing his vast musical experience to his teaching as well as his performing. We will never have too much of him here at Music@Menlo. 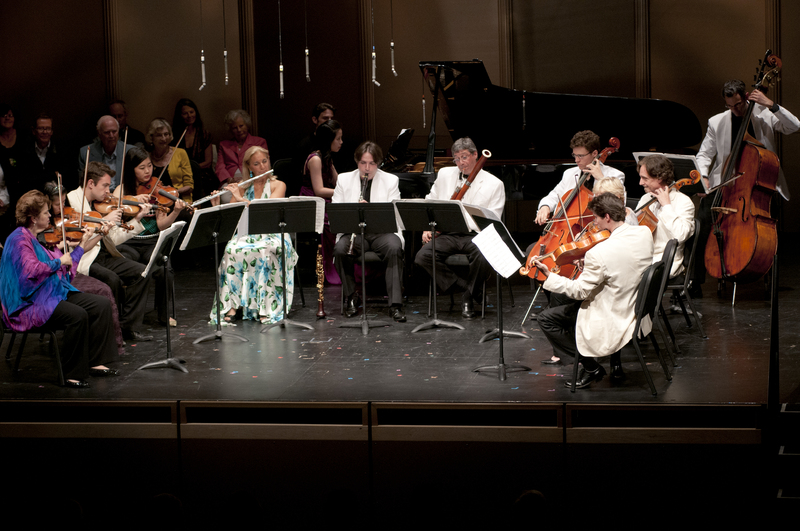 The evening brought an unprecedented event to the festival: an Encounter in the large Menlo Atherton Concert Hall. The reason for the change from our usual Encounter venue, Martin Family Hall at Menlo School was the Encounter’s unique requirements: a large movie screen. And the person who needed it was our Encounter Leader, pianist-composer Stephen Prutsman. 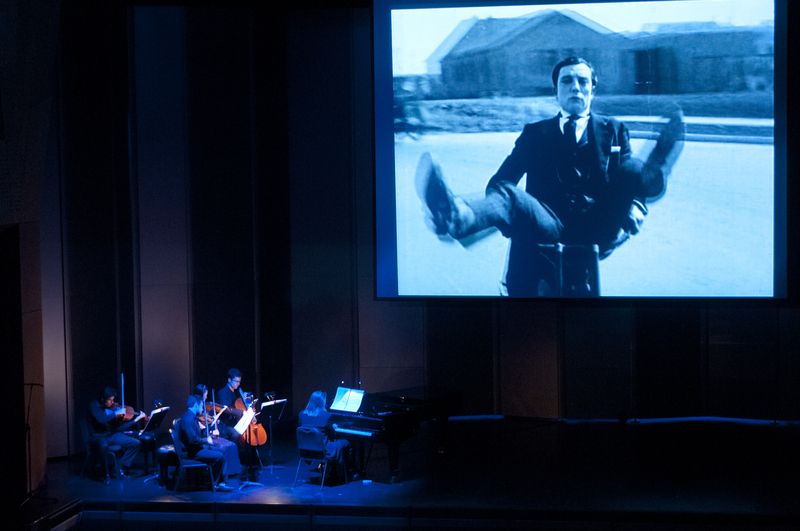 Tackling the subject of how music affects visual drama, Stephen brought with him his own works composed to accompany two silent films: Charlie Chaplin’s One A.M., and Buster Keaton’s Sherlock Jr. Joining Stephen at the piano on stage were clarinetist Jose Franch-Ballester (for the Chaplin film) and the Escher Quartet (for the Keaton). 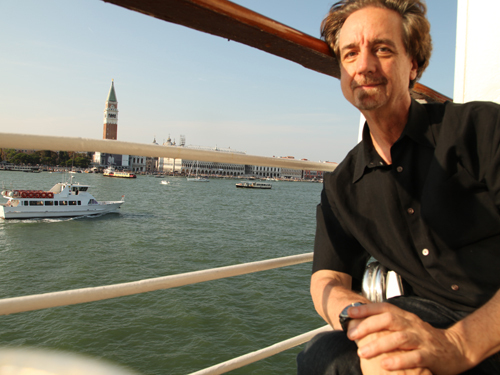 In between the films, Stephen was interviewed on stage in front of the large crowd by Artistic Administrator Patrick Castillo, who coaxed out of Stephen his amazingly diverse musical background, which includes, in addition to the most rigorous classical training, improvising in bars and nightclubs (to put himself through school), composing in all styles, and performing in concert a wide range of repertoire. The Keaton film, the longer of the two, is especially funny and has a complex plot, which kept the audience alternately rapt and in stitches. Stephen’s incredibly imaginative score was performed with consummate style and virtuosity by the Escher Quartet, with Stephen at the piano, all of them staring at the screen and keeping in sync with the film. It was quite something, certainly the first of its kind at this festival. 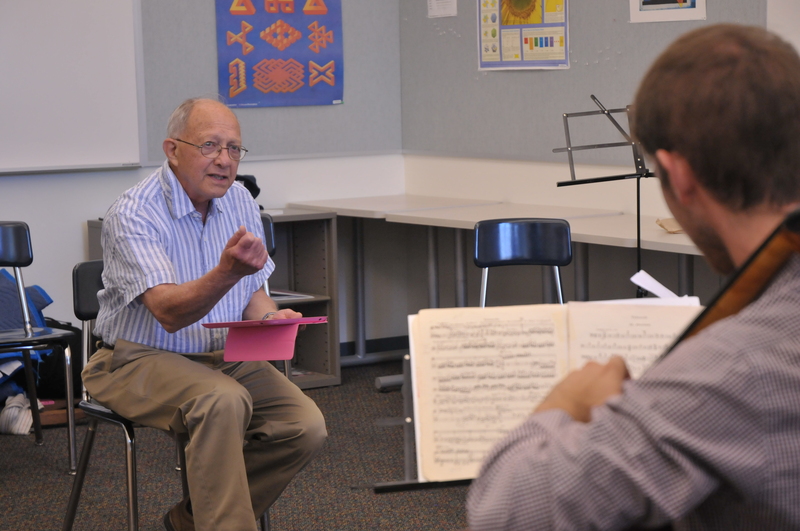 On Friday I had the opportunity – the first in at least several summers – to give a master class. 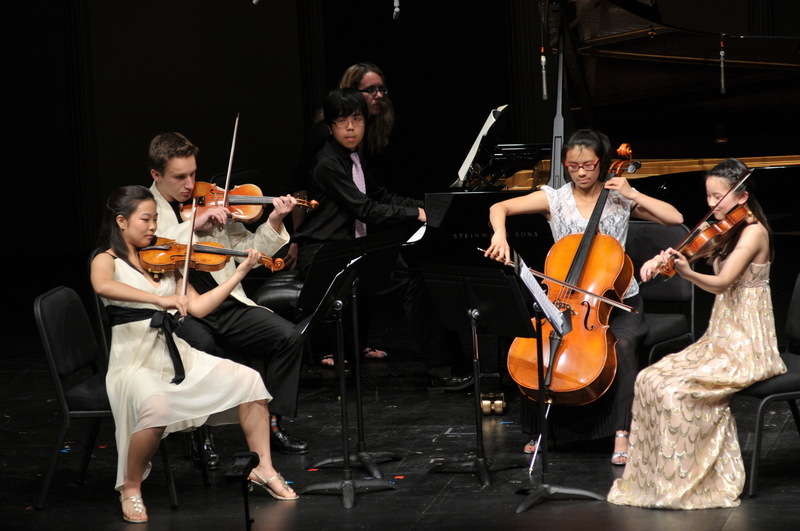 I heard a wonderful Young Performers ensemble play Beethoven’s Trio Op. 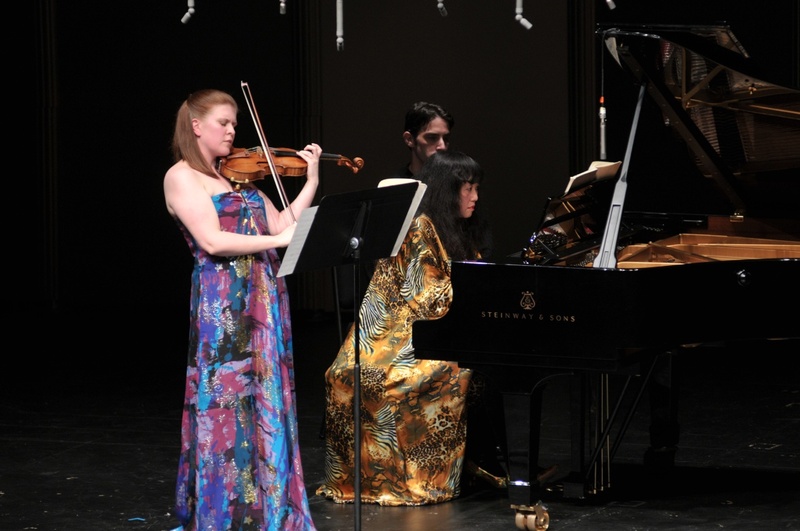 11, and a group of International Performers play Beethoven’s “Ghost” Trio. Having Beethoven as the composer at hand provided me too much of an exciting opportunity and I wound up talking way too much. Hopefully the students learned something that will help their performance, but I’m not really sure. After another great Prelude Performance, which this evening included the marvelous and seldom-heard Dohnanyi Piano Quintet in Eb, we presented Concert Program III, entitled Transported, featuring music that takes listeners to sometimes-distant places and cultures. 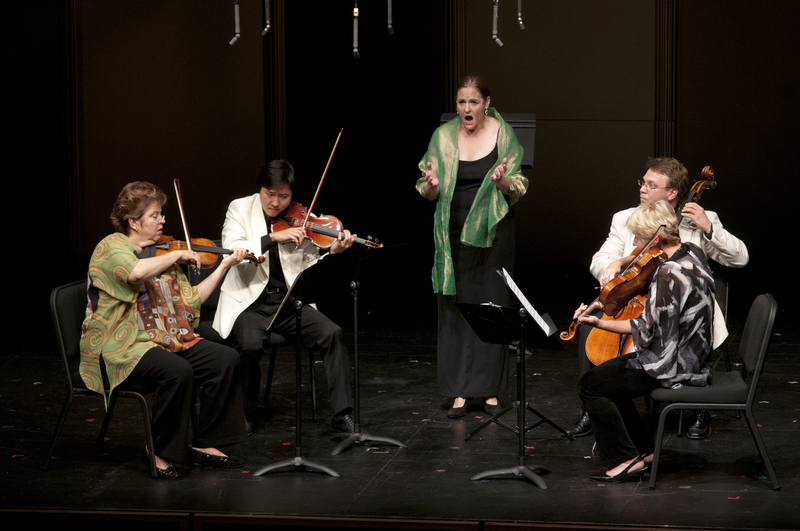 Barber’s Dover Beach was beautifully performed by baritone Kelly Markgraf and the Escher Quartet, after which Jorja Fleezanis and Jeffrey Kahane quickly took us from the English Channel all the way to China with Chen-Yi’s Romance of the Hsaio and Chi’n. Following this brief, mesmerizing piece came a performance of Sibelius’s String Quartet by the Escher Quartet, an extraordinary work that paints vivid pictures of the Finnish land and culture. Filled with sonic effects that bring to mind images of snow, ice, Vikings, the feel of the wind’s icy bite, being rocked at sea in a storm, the work is indeed one of the most transporting pieces that I know, and a work upon which this entire program was conceived and built. The Escher gave it the performance we expected and more: a display of quartet technique that was astonishing – even for a quartet veteran like me – coupled with intensity, daring, beauty of sound, and deep understanding of the work. 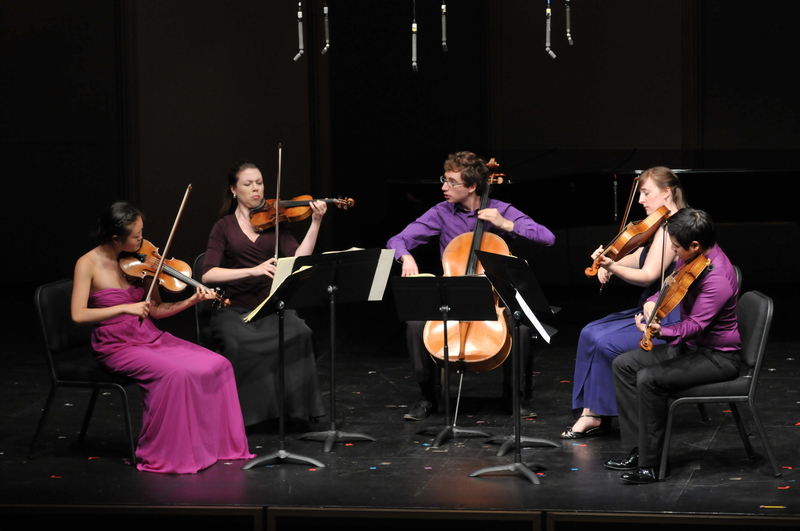 It was easily one of the best string quartet performances I have ever heard, of anything, and the audience – especially our Institute students who are immersed in chamber music challenges daily – rose to its feet in awe and appreciation. 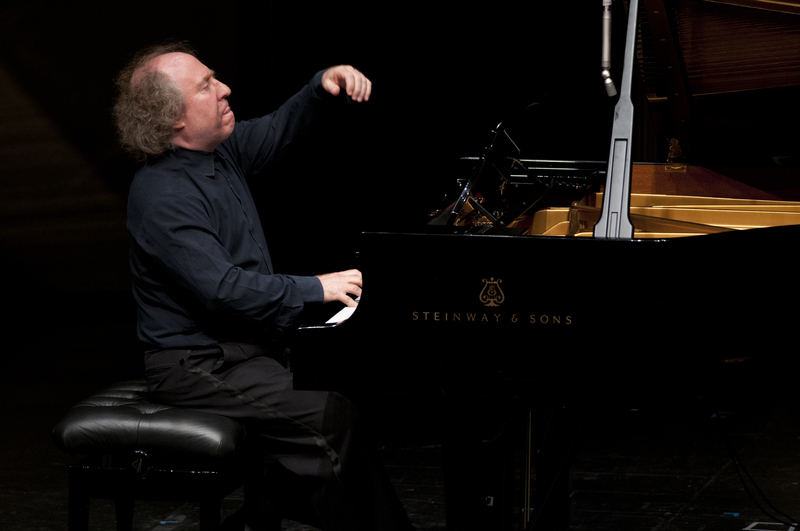 Following the intermission, the stage was taken by Wu Han and Jeffrey Kahane for an absolutely entrancing piano-four-hand performance of Debussy’s Six Épigraphs antiques, an incredible work that illustrates Debussy’s fascination with other cultures, in this case, ancient Greece and Egypt. 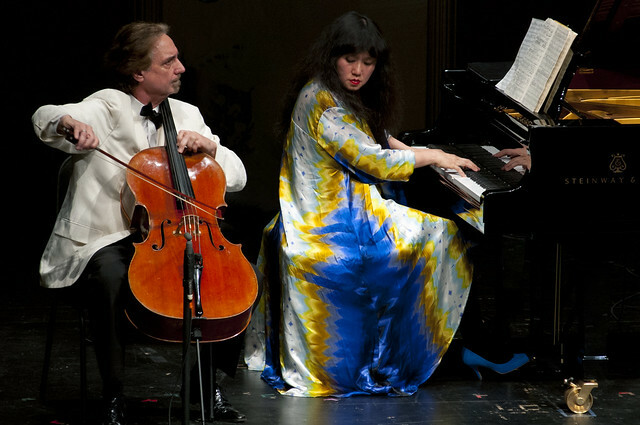 Wu Han then left Jeffrey alone to tackle excerpts from Granados’s Goyescas, a pianistic tour-de-force that was given a stunning performance, filled with color, atmosphere, and astounding virtuosity. The final work on the program was also a Music@Menlo first: a piece by Gustav Mahler. In the 1920’s, composer Erwin Stein made an arrangement of Mahler’s 4th Symphony for large chamber ensemble, and the final movement, with soprano soloist, is a sublime vision of heaven through the eyes of a child. The work was performed with enormous depth by Suzanne Mentzer, and the ensemble, expertly led by Jorja Fleezanis. The concert closed on a calm, and indeed transported, note. 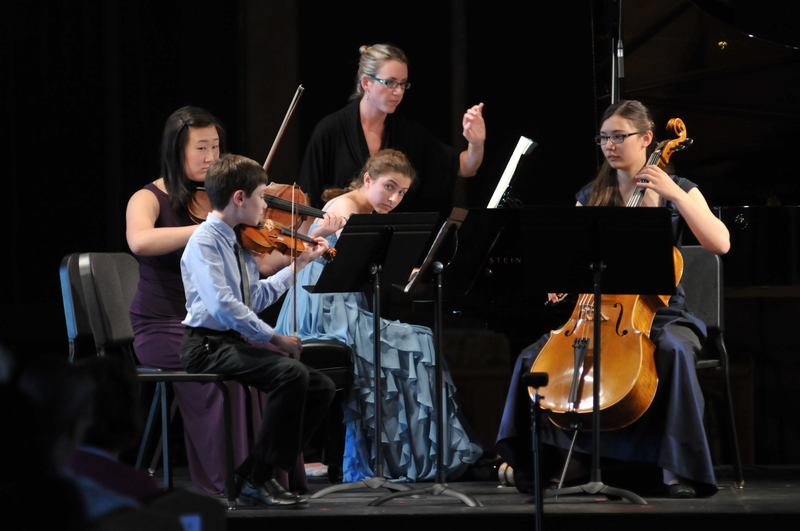 The festival’s second Saturday is always a big day for our Institute, as the first KYPC (Koret Young Performers Concert) takes place in the afternoon. These are marathon events that are led up to by not only numerous coachings during the preceding week, but also speech writing and delivery coaching, dress rehearsals including speaking, stage deportment and complete run-throughs. The YP’s, as they are called, vary in age from ten to eighteen, and although they are grouped somewhat according to age, ability and experience are the dominating decision-makers when it comes time to assign them their repertoire and colleagues. 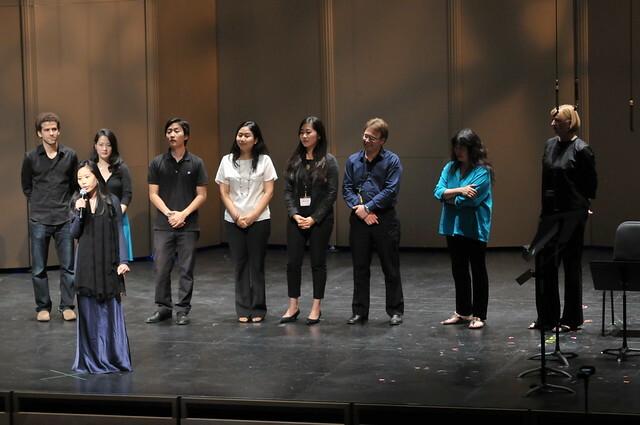 The Young Performers program is directed by pianist Gloria Chien, herself an International Performers graduate. Gloria is a remarkable pianist and musician who continues to expand her horizons and is steadily building an unassailable reputation. 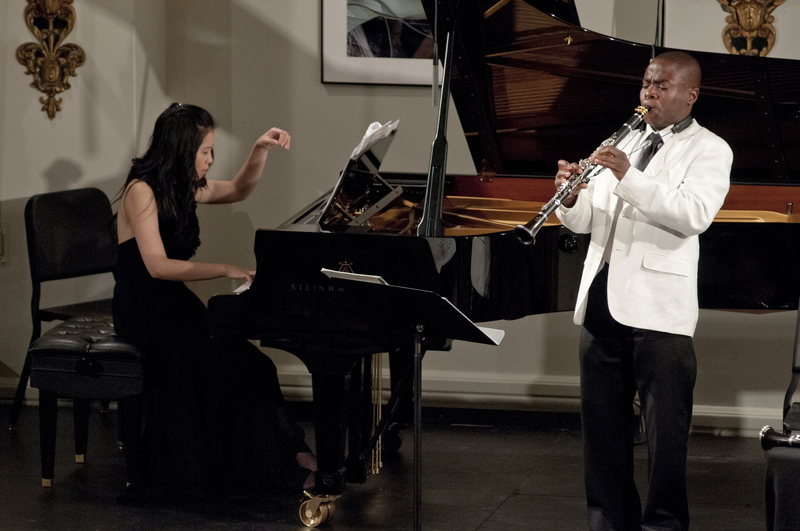 Her recital last week with Anthony McGill, delivered in the midst of her intense teaching schedule, displayed her stunning capacity for musical discipline and flawless performance under pressure. All of us are still trying to figure out when she had the time to practice. 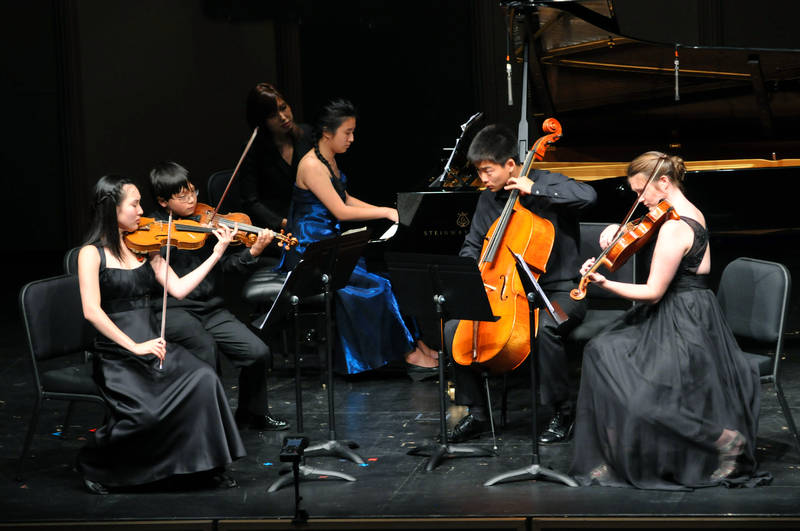 Gloria is assisted in her work as Institute Director by a team of teachers, each of whom is also an IP Program graduate: violinists Kristin Lee, Sean Lee, and Hye-Jin Kim; cellists Dmitri Atapine and Nicholas Canellakis; and pianists Hyeyeon Park and Teresa Yu. Overseeing the complex International Performers program is pianist Gilbert Kalish, who fills this newly-created position this year with poise and wisdom. 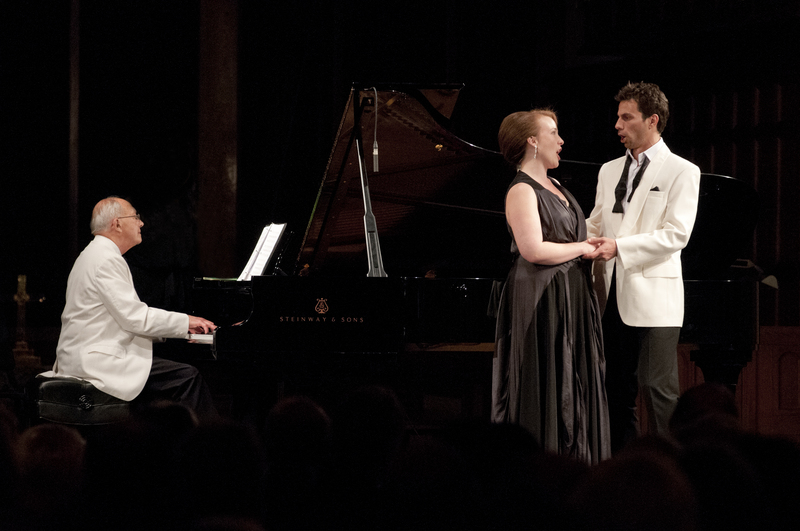 Saturday evening brought a long-anticipated Carte Blanche performance by mezzo-soprano Sasha Cooke and her husband, the baritone Kelly Markgraf, in the beautiful acoustics of St. Mark’s Episcopal Church, one of the festival’s original venues. 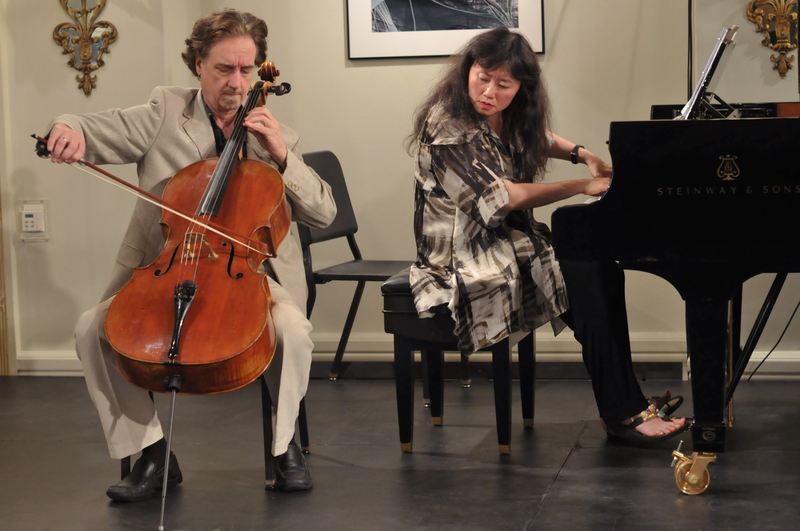 Partnered by Gilbert Kalish, one of the world’s leading vocal collaborators, the duo performed together and individually a wide range of repertoire, from Schumann and Poulenc to fascinating songs of Grieg and a powerful, anti-war cycle by Ned Rorem. The evening finished with a bit of Broadway musical theatrics featuring love duets by Jerome Kern, and everyone went away very happy. Sunday morning brought another extraordinary Carte Blanche concert, this one by Finnish pianist Juho Pohjonen. Music@Menlo has been fortunate this summer to have this remarkable artist in residence since the opening concert (in which we played the Beethoven Op. 70 No. 2 trio together). 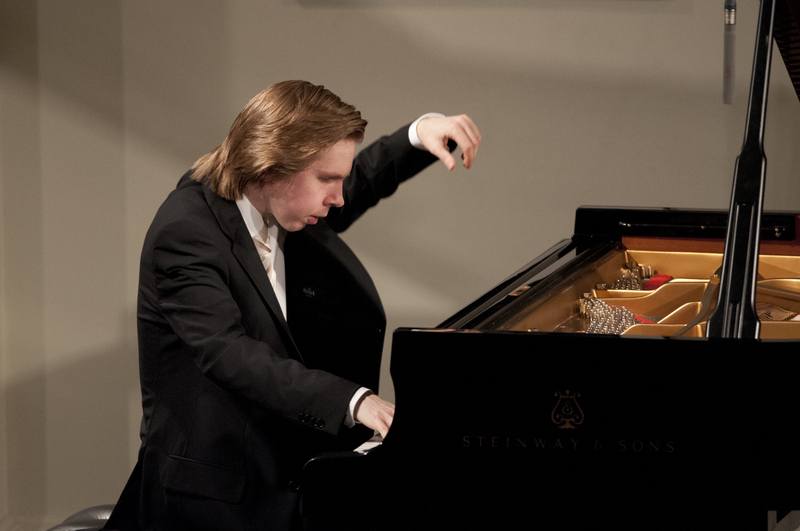 Juho finished off his stay with a bang, concluding his recital with Liszt’s fearsome Dante Sonata, a pianistic tour-de-force that left the capacity audience in Stent Family Hall agape. Preceding the Liszt was a fascinating pairing of music by Beethoven and Mozart with Scriabin, in a program that highlighted the idea of fantasy in music. We thank Juho not only for this spectacular concert but also for the special programming which contributed yet another perspective to this summer’s festival theme. 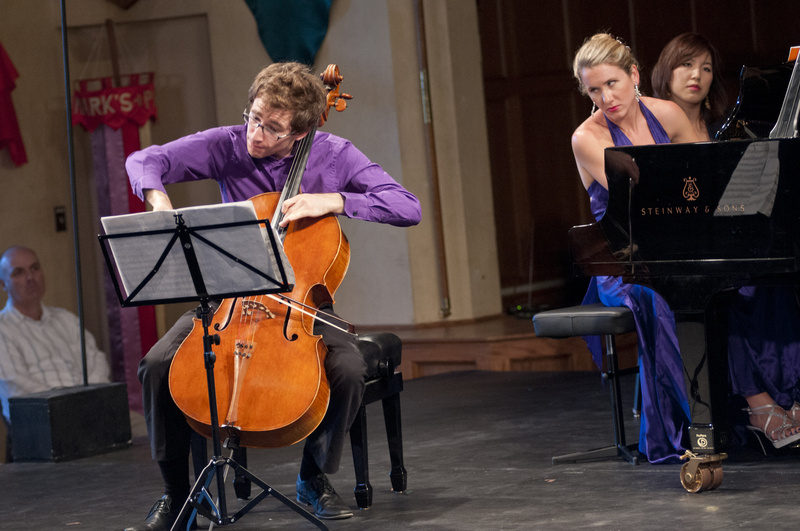 Sasha and Kelly’s magical recital, the inspiring KYPC concert, and Juho’s display of pianistic wizardry would have been enough for any festival weekend, but Music@Menlo is not just any festival. At six p.m. Sunday, Concert Program IV, Enhanced, began with the haunting sounds: the suite of movements by Bernard Herrmann composed for Alfred Hitchock’s classic film Psycho. Scored for strings only (for a movie shot in black-and-white), the suite is all the more remarkable to hear without looking at the film, as the sophistication of Herrmann’s writing emerges on its own. Following the creepy Psycho Suite was an equally chilling and more extended musical accompaniment: Andre Caplet’s The Mask of the Red Death, a fantastic work that narrates the Poe story in vivid detail, using a string plus harp. Performers Kristin Lee, Sean Lee, Paul Neubauer, Dane Johansen and Bridget Kibbey gave it a breathtaking and chilling performance. Following the Caplet, the mood turned more peaceful as Suzanne Mentzer took the stage for a sublime performance of Respighi’s Il Tramonto (The Sunset), accompanied by a quartet made up of Jorja Fleezanis, Sean Lee, Geraldine Walther, and Dmitri Atapine. The concert’s second half was given over entirely to a performance the likes of which has never been mounted at the festival: Stravinsky’s classic, The Soldier’s Tale, performed in its full version, which lasts just over an hour. Scored for solo violin, clarinet, bassoon, trumpet, trombone, double bass, and percussion, the piece tells the story of a soldier who is coerced by the devil into trading his violin for a book that tells the future. Three actors narrated the script: Kay Kostopoulos was the Narrator; Max Rosenak, the Soldier; and James Carpenter, wearing a suggestive red necktie, played the Devil. It was another first-of-its-kind extravaganza for the festival, which in its tenth anniversary season, is extending itself a bit in many directions in celebration of the milestone. Stay tuned for next week’s blog which promises to be just as packed with reports. And do visit the festival web site for reports and videos too wonderful to miss. *A special advisory: if you have not already, please visit the festival web site (www.musicatmenlo.org) to see the daily reports of the festival’s events and especially the spectacular videos created by Tristan Cook and his media team.